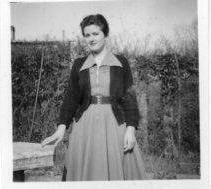 A photo of me, Betty Light, taken around 1952 just before my 16th birthday. The location of the bungalow. This photo taken in 2006. What a wonderful website this is! I only discovered it recently but have spent many hours exploring it already. I have put various comments in the Schools/Dr Eaton/Bread and Cheese Hill/Methodist Church sections but would like to add some more memories and ask a few questions. Dr. Eaton senior brought me into the world in September 1936 at a house called “Derekville” in Brook Road. My brother, Peter Light, was six and a half years old by the time I arrived and already a pupil South Benfleet Primary School. He insisted that my middle name must be Pauline because he liked a little girl who sat next to him in class who was called Pauline. 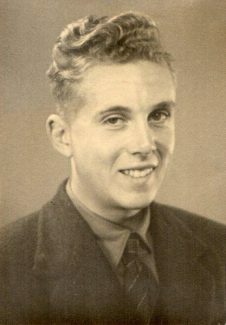 The photo of my brother was taken when he left Westcliff High School at 18 years old, just before he went into the army to do his 2 years National Service which he did before going to university – I think by choice. When I was about two years old we moved to “Arcadia” in St Mary’s Drive and it is the fourteen years there that I remember as my childhood. We lived near to the woods and fields that were at the top end of the road – at least they were in those days, now I believe there is a road through to Norwood Drive. My favourite place as a child was a hill always referred to as “The Rabbit Warren” reached by a path through those fields. Hours were spent playing in the trees on the top of the hill, sometimes with friends, sometimes alone when, if I kept quiet and still enough, the rabbits would appear. Needless to say, even now, at 77 years old I just love the film “Watership Down”! 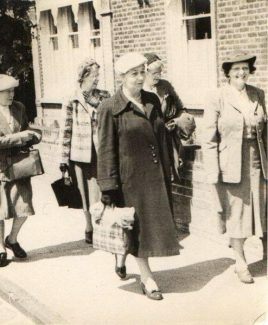 Exploring this website I have not seen any mention of the Women’s Institute in Benfleet which was an important part of my mother’s life during the 30’s, 40’s and 50’s. She was always known as “Mrs Light” rather than by her christian name of Lucy, John Downer reminded me of that after he read my comment in the Methodist Church section. At various times my mother was Treasurer, Secretary, organised coach trips, sang in the WI choir and acted in the Drama Group. Does Benfleet still have a Women’s Institute I wonder? As a pre-school child I can remember accompanying my mother to the monthly meetings and all the other activities with which she was involved. I was always armed with colouring books and crayons and would happily kneel on the floor, using a chair as a table, colouring in pictures for hours. Even after I started school I often used to go on the coach outings – one memorable one was to the Dr Barnardo’s Home at Kelvedon, a village between Chelmsford and Colchester. I was eight or nine years old at the time and decided there and then that I was going to be a Barnardo Nursery Nurse and work in that particular Home. Eventually, that is exactly what I did, starting my training a couple of weeks before my sixteenth birthday in 1952. In picture 6 the five ladies are on an outing to Felixstowe, probably a W.I. outing but it could be a Methodist “Sisterhood” outing as my mother was very involved with both. My mother, Lucy Light, in the foreground in the dark coat. Next to her, a Mrs Vernon. 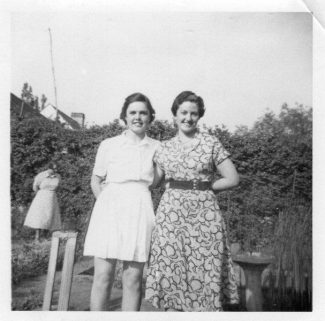 Behind my mother, in the check jacket, Mrs “Dorrie” Downer – John Downer’s mother. Next to her, nearest the building, Mrs Lawrence who lived opposite to us in St Mary’s Drive – very sadly lost her only son, Derek, with polio in the late 40s or early 50s. The other lady on the extreme left of the photo I remember but her names escapes me now! One of the comments in the war-time section recalls that infants did not go to school until they were six years old but I always thought I started in 1941 just a few days before my fifth birthday. Miss Gale, who was the Headmistress at the time, told me off because I was crying and told my mother off because she didn’t want to leave me while I was upset! I think we were probably both frightened of Miss Gale on that occasion but we later came to respect and like her a lot. Does anyone recall a grocery shop on the corner of Brook Road run or owned by a Mr and Mrs Rickard? I also think I remember the name “Mulley’s” as being a grocery shop in the High Street and “Bingham’s” being a greengrocers on the corner of St Mary’s Drive. Am I right or have the passing years made my “memories” somewhat confused? …we walked down the hill and across more fields to the railway line. No electric rails to worry about then and a clear view of the track in both directions so we were quite safe as we crossed but I think we liked to feel it was dangerous..
During the summer holidays, which always seemed to be warm and sunny in those days, my mother and two or three of her friends who had daughters who were my friends, often had a “day out”. We would walk across the fields, cross over Endway/Essex Way and make our way up onto the Downs heading towards the ruins of Hadleigh Castle. At a certain point, known to us as “The Glade”, we walked down the hill and across more fields to the railway line. No electric rails to worry about then and a clear view of the track in both directions so we were quite safe as we crossed it but I think we liked to feel it was “dangerous” as it added to the adventure! From there it was a short distance to Benfleet Creek which, nearer to Hadleigh, was a quiet backwater, not the busy stretch of water it was by the station and the swing bridge across to Canvey Island. Our mothers chatted while we played and built, not sand but mud castles if the tide was out. Germs? Yes, I’m sure there were but no one worried about such things then and, on the whole we were a healthy bunch of kids! Sadly, for various reasons, I never kept in touch with any of my childhood friends but Faye Letts, Shirley Cushings, Pat Hepple are the names that spring to mind when I think of Benfleet. Faye had an older sister and lived in, I think, Thundersley Park Road, a road almost opposite the school. Shirley lived at the other end of the village. I think she was an only child but she had a cousin who was my brother’s friend – they went on cycling trips together. Pat and her parents lived in Greenwood Avenue, a turning off St Mary’s Drive where I lived. Faye, Pat and I all passed our Eleven Plus and went to Westcliff High School for Girls. Shirley passed too but, for some reason, went to Southend High School rather than Westcliff High but we all travelled on the same bus every morning so our friendship remained intact for several years. In the 4th photo on this page my friend, Faye Letts, is on the left with me just before I left home to start nursery nursing. The 3rd photo is of me in uniform and was taken around 1954 after I started my training at a hospital in Kent. My mother wanted to see what I looked like in uniform so I took it home with me on one of my visits. 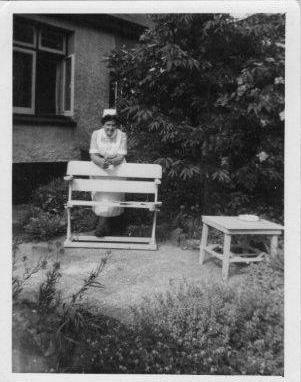 It was taken in the back garden of “Arcadia” in St Mary’s Drive – the square of concrete which was always grandly called “the terrace” was the base of our old air raid shelter. As for me, when I started work at Dr Barnardo’s I “lived in” so, in effect, left home and only visited Benfleet after that until about two years later I moved to Kent where I met my husband. 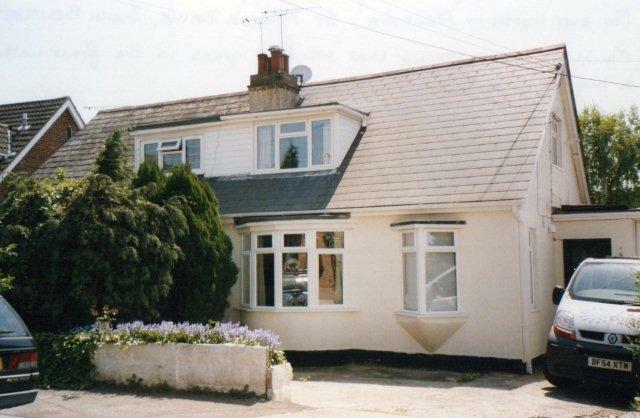 Now, we live in Somerset but, as often happens, the older I get, the more I remember my childhood in Benfleet. I wonder if anyone happens to remember me? The 5th photo on this page was sent in by Betty in reply to Denise Neale’s comment posted below. Betty has explained where the bungalow was in St Mary’s Drive. Hi Betty, Really enjoyed reading your page, the shop you remember on the corner of Brook Road and the High Road is probably Hopes Green Stores, 209 High Street – I’ve got an article on this site (with photo of the shop – about living there in the 1960’s when my Mum and Dad owned it but I’ve been struggling to remember who they bought it from. The name Rickard seems vaguely familiar, do you know when they left please ? Today, after a gap of over two years due to personal circumstances I have just logged on again. Thankyou for your entry Alan, sorry it has taken me so long to see it. I wish I had known Faye as an adult but I can imagine her – she was “a character” even in her teens! Do you by any chance have a photo of her? I knew Faye Letts from when she was a teacher/librarian at Mzilikazi High School in Zimbabwe. I met her again in late 2002, shortly before she died. I taught at Mzikikazi High School for two years (1996/97). Faye was certainly a character and was very thorough in how she ran the library. I used to get lifts with her in her old white Datsun to school in the mornings. She played the piano at assembly. There are many in Bulawayo who will remember her. I have no recollection of the house name Derekville and it does not appear in the record of house names/numbers that is on our site. So I cannot help there. Thankyou for that John – I was sorry to hear that Faye had died but not surprised to know that she had become a teacher etc. or that the Methodist church had been part of her whole life. If you are in contact with Edna Letts at any time, please give her my regards although I doubt if she would remember me! She might remember my brother - he was quite “smitten” with her at one time! When I found that photo I could immediately “see” your mother – such a gentle soul who was always so kind to both my mother and I. I imagine our two mothers met in Brook Road as well as in the church – do you by any chance remember a Mrs Wilder? I have no photo but a very vague memory of her living opposite to Derekville in Brook Road. It was wonderful to see the picture of my mother with a group of ladies, almost certainly from the Sisterhood at Benfleet Methodist Church, and the one lady Betty can’t remember was Mrs O’Dell. She and her husband lived next door to us in Brook Road. It was a detached bungalow on a fairly large plot with plenty of apple trees and huge willows. It has long since been demolished. Faye Letts, also mentioned in the article, went to what was then Southern Rhodesia to teach, spent her life there as a teacher and she became a Local Preacher in the Methodist Church. Then about 15 years ago, having retired from teaching, she visited Benfleet. She died about 6 years ago. Her older sister, Edna, still lives in Birchington and I hear from her occasionally. My parents were great friends with the Letts family. Only recently had their house in Thundersley Park Road been demolished. There are now two houses on the site. From the list of house names and their ‘new’ numbers on the Archive site it appears that Arcadia became No. 76 and, as Denise Neale remarks, it still exists. The bungalow is definitely still there and only a few doors from where we live, probably changed somewhat from when you lived there! Betty’s reply to the above comment, together with photo of the bungalow taken in 2006 (above). I visited Benfleet in 2006 for the first time since I left in 1954. Arcadia and its semi-detached “twin” were still there but I neglected to note the number! Perhaps this will help you to identify them. On the right hand side of the road about eight properties down from the top of the road. Chalet bungalows with a dormer window in the roof. A bay window and a small “triangular” bay at the front. Door set back on the right. Two windows at the side, one just before the door the other in the gable end above the door and flat roof. Walls cream. Front hard standing with low cream wall part way, flowers growing in the top of it. Very tall and overgrown fir trees between the two semi’s. I would be very interested to know if, seven years on “Arcadia” is STILL there! I live in St Mary’s Drive and wonder if you can remember the house number of Arcadia as I would be interested to know if the property is still here or been demolished to make way for new houses.